Every year, Achehnese in Europe, particularly in Sweden and Denmark, demonstrate to raise awareness about the human rights violations they undergo, such as arbitrary killings by the Indonesian military. UNPO stands behind the Acheh Sumatra National Liberation Front and supports the Acheh's right to self-determination. May 1 is considered as the Labour Day by almost all the nations of the world. For Achehnese, this particular day is used as a day to tell the world that Acheh still exists as a nation and still fights for this right. 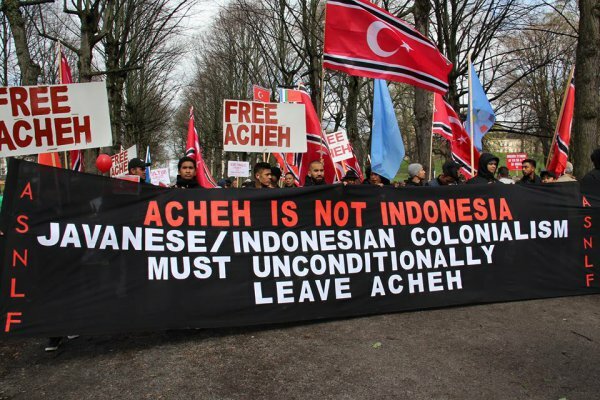 Every year, Achehnese in Europe, particularly in Sweden & Denmark, demonstrate on the street to tell the public about human rights violations in Acheh, such as arbitrary killings by the Indonesian military, voice the aspirations of self-determination that have not been guaranteed in Acheh. Achehnese abroad still cling firmly to the struggle of Free Acheh that never stop voicing to the international community that Acheh is as a nation but its homeland was stolen by the invaders of Indonesia. Although in the spring with cold weather, almost all Achehnese in Sweden took to the streets voicing their aspirations to the Swedish people who were standing on the right-left-hand side Stockholm city downtown street. This year the Acheh-Sumatra National Liberation Front (ASNLF) conveyed the theme "We gathered here today to give our respect, solidarity, and prayers to thousands of Achehnese heroes who have been unlawfully killed by the Indonesian military from Jakarta". A striking thing this year, we saw the emergence of a new generation of Achehnese in Europe. Not only young men but young girls as well who were born in Sweden, standing in front of the parade, such as Azizah Abdurrauf, the daughter of an Achehnese activist in Sweden. Despite her age, she has dared to appear before the public by speaking in Swedish and Achehnese. As with ASNLF previous commitments, they are seriously preparing new cadres to be deployed for future use in international fora for advocating Acheh case. Unlike Sweden, the 1st of May in Denmark is not a holiday. However, ASNLF activists from Denmark were still sacrificing their time and raising the Acheh Independence flag in the city of Aalborg, Denmark's fourth-largest city. The participation from Denmark was very meaningful because they never subsided for their support. This was an evidence shown to the public that the struggle of Free Acheh never stops, as well as its ideology. "That commitment needs evidence, not just rhetoric. Therefore, we remain faithful to this struggle. Stand up and be counted for an independent Acheh. Stand upright as the tree stands." It was a message from the Achehnese-Danish Committee quoted from Facebook's wall to other Achehnese in social media. During the demonstration, the star-crescent flag of Acheh’s independent movement was raised among banners in Danish and English banners saying "We Demand an Independence of Acheh, and Independence is the only solution for Acheh". Videos of the demonstration here and here.